Sometimes your event may be formulated already. You have planned and produced your corporate entertainment ideas into a successful end of event and your clients just want to relax and have a good old party at the end of the delegates week. Then hire The Cheatles Beatles tribute band for your end of conference bash, easy. Click here for The Cheatles great idea at Unite The Union Corporate Entertainment event. There are other occasions when clients know they want music but do not have a plan ,they need to consult with us for extra corporate entertainment ideas such as where to stage their business event. In this instance we can recommend venues and spaces that we have used before and that have the required facilities and transport links. We recently recommended The Alma De Cuba Club on Seel Street Liverpool for a large medical conference. The clients were from all over the world and the client needed a first rate venue with space for 500 to eat, network and let their hair down. The Alma is an old church and The Cheatles Beatles tribute band performed on what was the old alter. The corporate entertainment bookers were worried that the clients would not relax and dance but with such a great venue and right in the heart of Liverpool the atmosphere was electric, everybody danced the night away for a hour and a half. 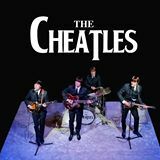 The Cheatles often get asked to perform in between other business events or entertainment, clients will ask if its ok for the band to run in and play a couple of songs as a surprise or play an acoustic set where space maybe limited. All these corporate entertainment ideas can be accommodated because we have the experience and contacts to make your business event ideas for entertainment become a reality.